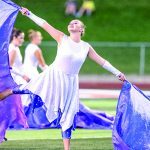 On September 29, 2018, the Rockford High School Marching Band (RHSMB) kicked off their season with a strong start at Bands of America (BOA) Regional Championships in Bowling Green, Ohio. The RHSMB, under the direction of Brian Phillips and Evan Bahm, wowed the audience with their show titled “Amongst the Stars.” In their preliminary performance, Rockford scored a total of 77.15, making them one of the top five bands out of the 25 in attendance. Scoring is made up of a combination of three categories: music performance, visual performance, and general effect. The Color Guard really captures what it’s like to be “Amongst the Stars” as they spin their galaxy-inspired flags during the ballad. Photo By John Vancil. The RHSMB, based on their preliminary performance score, was able to perform again in finals which consisted of the top ten scoring bands from preliminary competition later that evening. However, it wasn’t all smooth sailing. The wait for our name to be called as a finalist was tense. “They [the Rockford Marching Band] wanted nothing more in the world than to perform again that night. 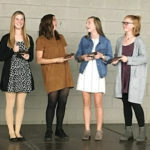 The tension was so high until they finally announced our name as the 7th finalist band,” senior Kyle Hintz told us as he thoughtfully reflected on the situation. The RHSMB was the top scoring school from Michigan out of the 5 states represented, coming fourth overall with a score of 79.77. 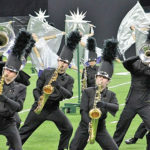 The other Michigan schools to make finals were Walled Lake Central High School (5th place with a score of 77.925), Plymouth-Canton Educational Park (9th with a score of 72.850), and Jenison High School (10th with a score of 71.950). The overall Grand Champion was the William Mason High School Marching Band from Mason, Ohio, who earned a score of 83.95 and all the caption awards for Best Visual, Best Music, and Best General Effect. Overall, the day at Regionals was very fulfilling. Senior Drum Major Dwight Hua says: “At the end of the day, everyone was just super excited to be there. The placements and scores weren’t really a big deal. 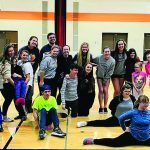 It was the experience of going through a regional and performing our best performance that we could throw down.” After talking to more students, we found that other people seemed to agree with Hua. “It was a very emotional day with many ups and downs, but what really matters is that we put on a fantastic show and gave it our all. I think that we all left the field knowing that we put on the best performance that we possibly could and had fun doing it,” junior Erin Gaynor stated. 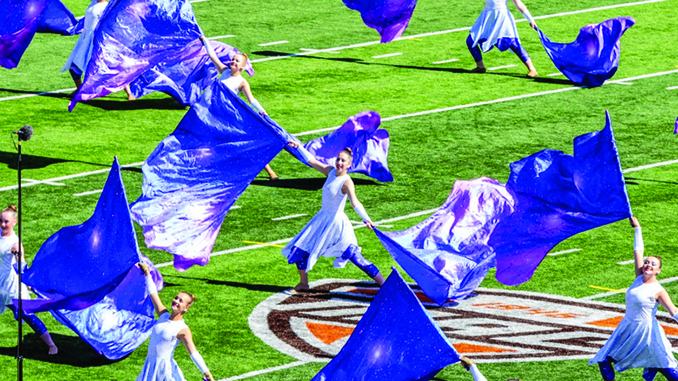 If you haven’t seen the Rockford Marching Band in action yet, check them out at the next invitational at Jenison High School on October 20, 2018. They will perform in the evening and everyone is welcome.